We’re having a respite from the heat today (and the next few days, it looks like) but there’s no denying: it’s been brutal out there. Our regular demo garden workday Tuesday morning… happened; we actually got a lot done, but I was so wiped out I don’t exactly remember what. So what to do when it’s so hot out you can’t think? Well, drinking water while you’re working is the most important thing to remember (dress in breathable clothing, stay in the shade when you can, soak a handkerchief and put it around your neck, etc.) 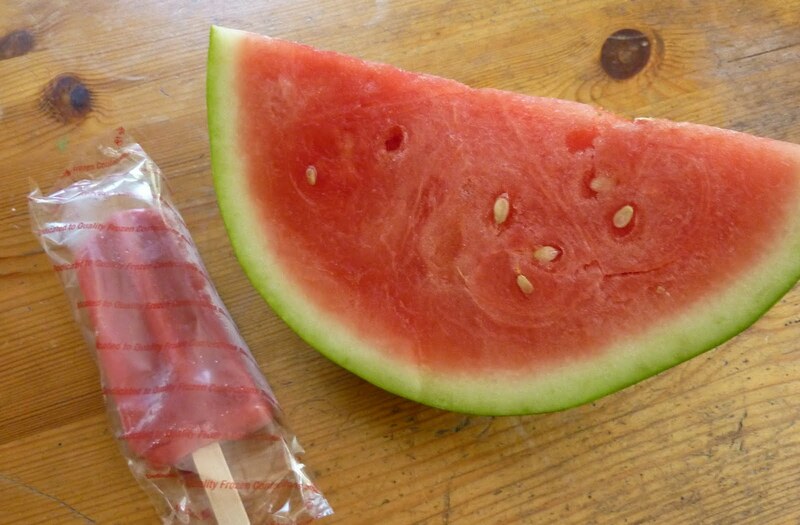 but when I got home the first thing I did was eat a popsicle, then I took a shower, then I ate a big slice of watermelon. Then a drink of water! Whew. The watermelon may not be locally grown, but there’s nothing quite as good for filling up your personal water table while feeding you much needed calories. Late in the summer we’ll have our own, I hope (finally got the seeds in the ground Tuesday. See, I remembered one thing…). Popsicles are great too. You really don’t have to have kids in the house to buy them. Or make your own. It’s great if the temps are soaring to be able to get garden chores done early in the morning or late in the evening. Better not to water in the evening, since water on leaves overnight can promote fungal diseases. One of the best investments you can make, that will save you time watering when you could otherwise be weeding (or harvesting, since that sounds more attractive), is a drip irrigation system. We started installing ours in the demo garden last week. 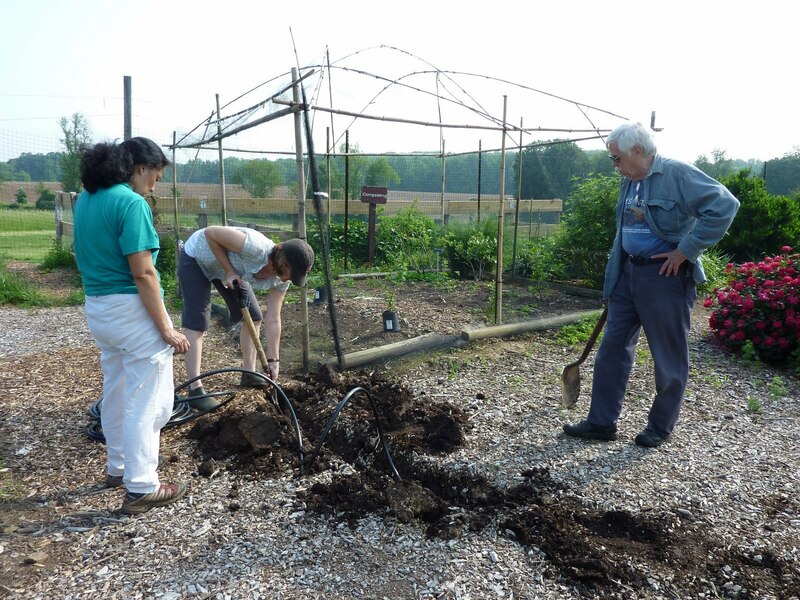 Lily, Barbara and Joe are burying the main line as it crosses the path, so none of us (that would be me) trips on it. Otherwise it doesn’t need to be buried but a coating of mulch helps keep temperatures down and aesthetics up. We have a little tightening up to do, along with setting the timer, before the system runs without regular visits from any of us. Fingers crossed. Vegetable plants are generally water hogs, but having a few around that aren’t is helpful. So far the New Zealand spinach that I put in a pot is doing well despite a lack of recent rain. 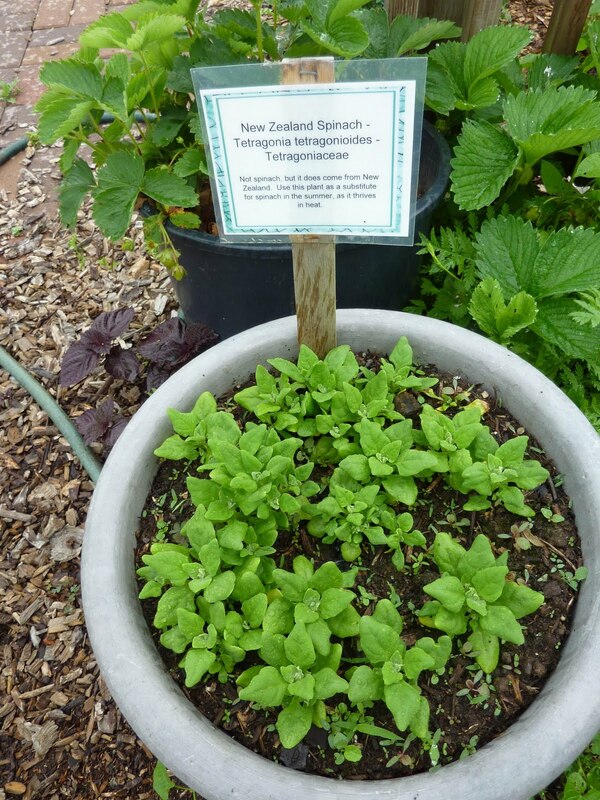 This is a great crop to substitute for spinach (which bolts as soon as you even mention the word “June” in its presence). I’m growing it in my salad table as well. It’s in a pot because (remember my geographic arrangement of the garden?) that’s where the Pacific Ocean is, way at the end of the vegetable beds beyond Asia. We transplanted it there from the spot it was growing in last year (either it wintered over or reseeded). I plan to run a little mini-dripline into the pot from the main line, so it will get some irrigation, but so far no problems. How do you deal with heat and drought in your garden?